If you have never heard the term before you may be wondering “What is blepharitis?”. Blepharitis is a common condition which causes inflammation of your eyelids. This affects the skin around the base of your eyelashes and may be caused by staphylococcus bacteria. This is where the inflammation affects your Meibomian glands. These are tiny sebaceous glands at the rim of the eyelids. They supply an oily substance that prevents the evaporation of the tear film. When the glands become blocked this causes posterior blepharitis also called Meibomian gland dysfunction (MGD). The condition can also be a complication of a skin condition such as seborrhoeic dermatitis. This condition cannot be totally cured but symptoms can be treated to keep flare-ups to a minimum. Soak a flannel or cotton wool pad in hot (not boiling) water and press it gently onto your eyelids for 5-10 minutes. Keep reheating the compress when it goes cold. This helps to remove any crusting from your eyes and to unblock the Meibomian glands. The warmth from the compress allows the oil in these glands to run more freely. There are also specially designed eye bags and eye masks available for this purpose. These are heated in the microwave according to the instructions with it and placed over the eyes. Your optometrist can advise you on special blepharitis wipes and solutions that you can use to cleanse your eyelids and which are readily available to buy. Alternatively, you can add a few drops of baby shampoo (ratio of water to shampoo about 10:1) to a cup of water which has been boiled and then allowed to cool. Using a cotton wool pad, dip it into the cooled water then squeeze out the excess liquid. Wipe the eyelids being careful not to clean inside the eyelid with the cleaning pad. Wipe the eyelids with a fresh flannel or pad rinsed in water only. Try to repeat this twice a day until the condition improves. Ideally, you should try to do this at least once a day afterwards to maintain good lid hygiene. 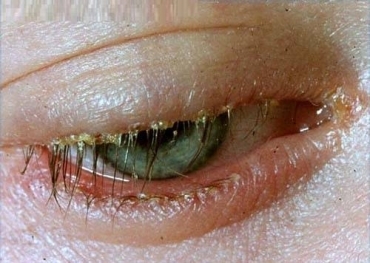 It is best to avoid wearing eye makeup while treating belepharitis. Once the condition improves make sure to replace any liquid-based eye make-up you used previously to the flare up as it may be contaminated. Often blepharitis is associated with dry eyes. Using eye drops or gels to lubricate them may help to ease the symptoms. Antibiotics: Blepharitis that doesn’t respond to a regular cleaning routine may require a course of prescribed antibiotics. You may need to use these for several weeks before the condition starts to improve. Antibiotics may be topical or oral depending on what your doctor recommends. So, if you are suffering from swollen or puffy eyelids; burning, gritty eyes; itchy, sore, red lids, all of which could be symptoms of blepharitis, then contact us to make an appointment with the optometrist to have your eyes checked as soon as possible.